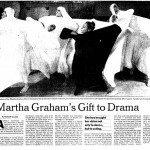 Martha Graham was an icon long, long before we ever worked with her (1983-1991). 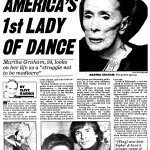 Further fame was not what she needed, though selling tickets to her two seasons at The New York State Theater and City Center engagements were. 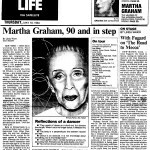 Among our most notable achievements during our eight-year relationship with the company was the front page, top of the fold “Arts & Leisure” story that commanded the entire top half of the paper. 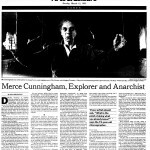 It was the first time that Arts & Leisure had ever accorded that kind of real estate to a story. 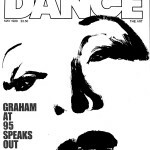 In the late 80’s, modern dancers assumed the baggy sweatpants, torn t-shirt, too-busy-to-put-on-lipstick-for-a-photoshoot look; The Graham dancers came decked out in their gold leotard and tights and full make-up, including false eyelashes. 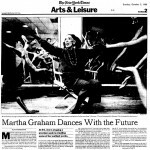 The photo by Michael O’Neil was a startling shot of Graham, her arms flung out with the exuberance of a high school cheerleader, the dancers reflected in the mirror behind her. 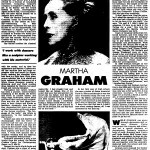 Graham, at 85 and still in full command of her wily charm, had engineered the shoot. The Graham Company always had the most spectacular galas, drawing armies of movie stars including Elizabeth Taylor, Woody Allen, and Gregory Peck. 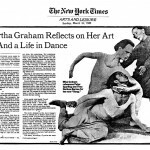 In 1987, Rudolf Nureyev and Mikhail Baryshnikov agreed to dance together in Graham’s Americana classic “Appalachian Spring.” Nureyev was the preacher and Baryshnikov the husband. The two Russian matinee idols—and fiercely loving competitors—dancing together was the evening’s first history-making event. The second was at the gala dinner, which followed the performance at the Pierre Hotel on 5th Avenue. 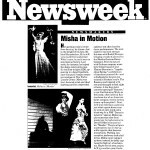 Nureyev poured a glass of wine over Graham’s manager’s head when he discovered that the manager had given American Ballet Theatre, which was under Baryshnikov’s direction, the rights to Graham’s “Diversion of Angels,” which had been first promised to the Paris Opera Ballet of which Nureyev was the director. I managed to keep the event off The Times’ Social Page, but the incident, which landed on Page Six of The New York Post, was widely circulated under the manager’s proud direction.